Safety-conscience clients conduct quasi-static load testing at CAPE to analyze the integrity of their vehicle anchorages, seating systems and restraint systems, as well as to document their compliance to standards. Static pull testing with a programmable closed-loop hydraulic system demonstrates component strength and helps engineers determine how to approach strengthening systems to achieve optimal performance. 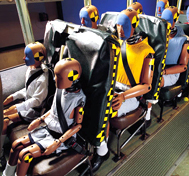 CAPE has the ability to conduct testing in multiple occupant positions to FMVSS 207, 210, 220, 222 and 225, as well as ECE R14, ECE R17, SAE J386, SAE J1948, SAE J2292, FMCSR 393.76 and ISO 6683.